Uptown living meets charming riverfront neighborhood with these upscale apartment homes in Downtown Fort Worth, Texas. Domain at the Bluffs offers the beauty of city amenities enveloped in nature. For their homes they wanted something unique, practical, and of course aesthetically pleasing. 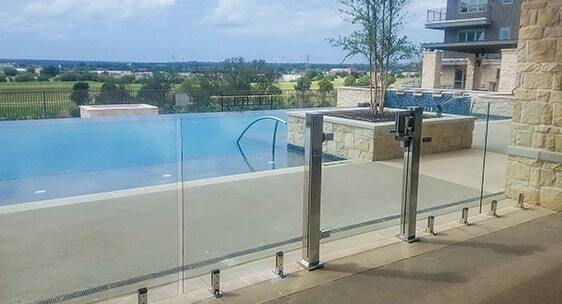 We installed a top of the line commercial glass gate with a push-button combination lock. This allows access with a code rather than a standard key lock, for easy and secure access. 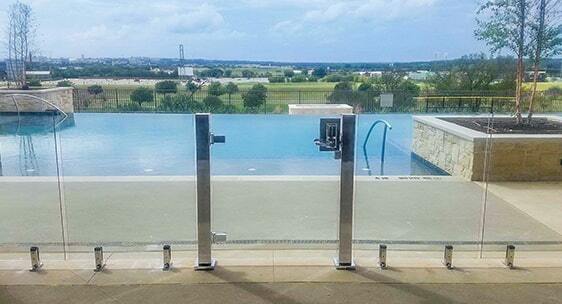 This lock system can also be used with our popular frameless gate. A polished stainless finish on the hardware adds the final touch to really make this look stand out from the rest.